Construction for the metro rail line on Crenshaw blvd. Street closures, which include some that stretch into the night, are continuing along the route of the Crenshaw/LAX line as the city constructs multiple tunnels for the project. Construction on this area is beginning on Friday. The 8.5-mile Crenshaw/LAX rail line is one of 12 projects funded by Measure R, the half-cent sales tax approved by Los Angeles County voters in 2008 to pay for transportation projects and improvements. The project is slated to be completed in 2019 and have eight stations. Metro says road closures could branch into two weekends in October. Crenshaw Boulevard between Coliseum Street and Exposition Boulevard will be completely closed. All of Crenshaw Blvd. will be closed between 48th and 43rd streets. Vernon Avenue between Crenshaw Blvd. and Leimert Avenue will also be closed from 9 a.m. to 6 a.m. this weekend and next weekend. 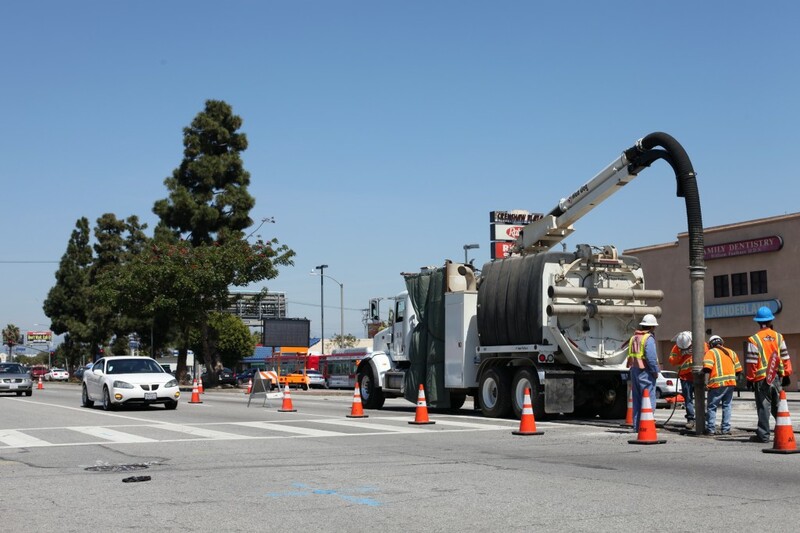 A detour will redirect north and southbound traffic around the center of Crenshaw Blvd. between 59th and 67th streets. La Cienega Boulevard at Florence Avenue will be closed at night from 9 p.m. to 5 a.m. until Monday. La Brea Ave. will close down on the weekdays from 9 p.m. to 5 a.m. until Sunday, Oct. 6. What do you know about the Watts Riots? Remember and learn at WATTS REVISITED. Discover the creative minds and spaces of a neighborhood in transition. What's in a name? Read comments and share your own perspective.